Big shocker here: The main draw to Hilton Head, as with much of the SC coast, is the beach. You’ll find a number of fantastic beaches on HHI, primed and ready for sunbathers, surfers, and sandcastle constructors alike. Some of the more popular options are Coligny Beach, Burkes Beach, Folly Field Beach, and Islanders Beach, and while most of the beaches are dog-friendly, there are rules about what times dogs are actually allowed. Also, a few of the beaches even feature private bathrooms or changing rooms, meaning you don’t have to wait till you get back to your hotel to remove the sand from where it shouldn’t be. 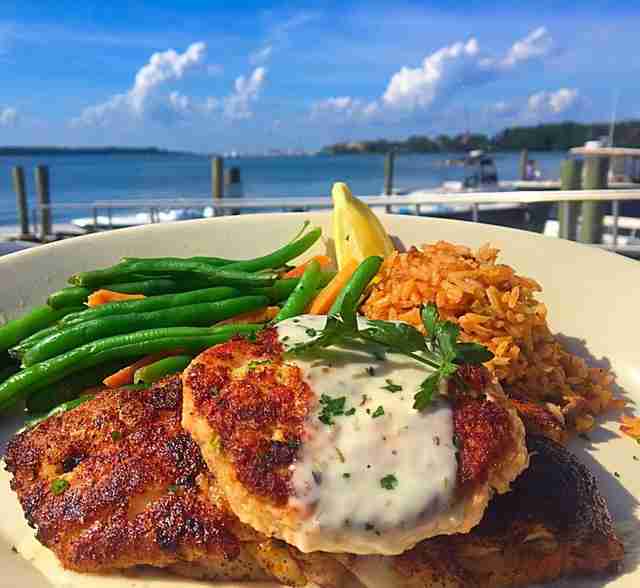 Although the island is small, Hilton Head is home to a number of restaurants that are sure to please even the pickiest of palates. 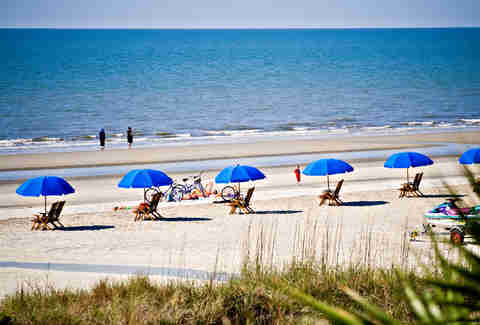 Of course, when most people think of the beach they think “seafood,” and there’s plenty to be had on HHI. Some of the most popular seafood joints are Hudson’s Seafood House on the Docks, Skull Creek Boathouse, and The Sea Shack. If you’re no fan of the sea’s bounty, there are plenty of restaurants that focus on non-seafood fare, like Lucky Rooster, Lowcountry Backyard, and Chow Daddy’s, all of which have amazing cuisine with a Southern flair. For more adventurous or sophisticated eaters, Porter & Pig gastropub features creative small plates and cocktails, and Frankie Bones Restaurant and Lounge serves up some killer Italian food, perfect for when a pasta craving strikes. If you’d rather go for something completely different, the popular Ruan Thai Hut has some of the best curry and pad Thai on the coast. 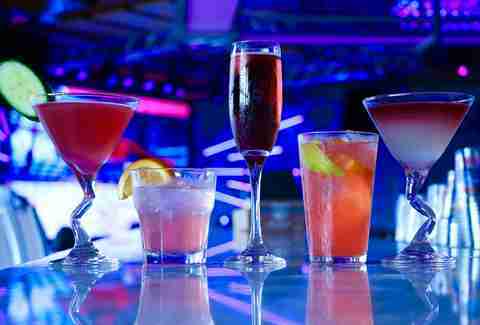 Although it doesn’t have quite the party scene as Charleston or Myrtle Beach, Hilton Head still has plenty of cool spots at which to whet your whistle. 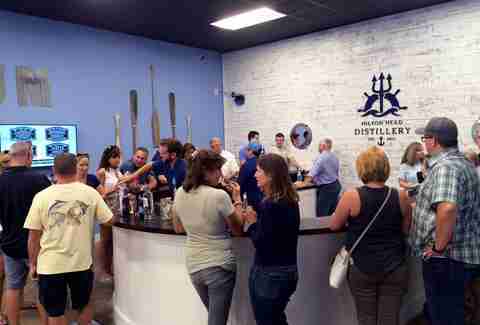 Liquor lovers will appreciate a tour and tasting of Hilton Head Distillery’s flagship brands, Mountain Peak espresso rum, Aermoor vodka, Redlock spiced rum, and Two Traditions rum. Grab a bottle to take home for a much cooler souvenir than a seashell. The Tiki Hut encompasses that quintessential beach vibe, especially since it is literally on the beach (on Coligny Beach), and is known for its live music, frozen cocktails, and ice-cold beers, which will definitely put you in an island state of mind. Pool Bar Jim’s beach club bar is located poolside at the Sea Crest Beach Bar and is run by a mustachioed man named Jim, who is a self-described “connoisseur of frozen cocktails.” They’re known for their Lava Flow cocktail, a dangerously tasty frozen beach drink consisting of strawberry, coconut, bananas, and rum, topped with whipped cream. 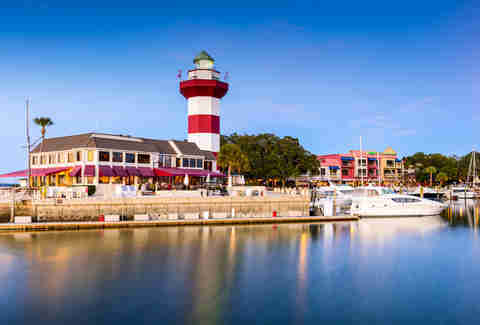 Having been around for over 300 years, Hilton Head Island is home to a number of sites that are worth adding to your “must see” list. Nature lovers will enjoy Sea Pines Forest Preserve, which is home to a number of nature trails, the 4,000-year-old Indian shell ring (its purpose, much like Stonehenge, remains a mystery), horseback riding and tours, wagon tours, and picnic spots. Jarvis Creek Park Nature Trail is another option, featuring a 1-mile loop that’s good for walking, jogging, or alligator watching. The remnants of Fort Howell, built during the civil war, is the perfect balance of history and nature; there might not really be any of the physical fort left, but the land it was built on is quite breathtaking. For all of the pharologists -- a word we totally didn’t look up just for this article -- visiting the island, the Harbour Town Lighthouse and Museum is definitely worth a visit. Home to the only female lighthouse keepers in North America, this 47-year-old lighthouse is one of the most iconic sites on Hilton Head. 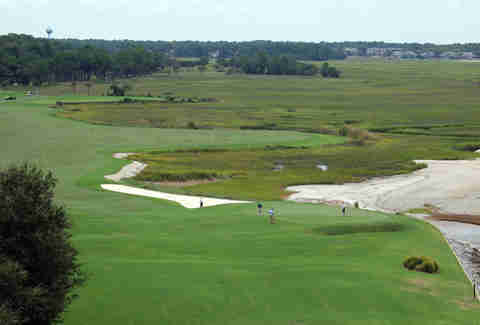 Your $4.25 admission fee means you can climb up the 114 steps (90 foot) to the top and get some pretty fantastic views of the Harbour Town Golf Links, the island, the ocean, and the surrounding marsh. Wiseguys is technically an upscale steakhouse, but is beloved by locals and visitors for its fantastic happy hour (25% off bottles of wine, $1 off drinks, $2 off small plates), creative cocktails, healthy bourbon and whiskey list, and detailed wine selection -- you can even get wine flights! 843 Restaurant’s happy hour food menu features super creative options, like a baja fish taco, tuna slider, or truffle fries, each for under $5. If you’re looking for something to really get your blood pumping, Zipline Hilton Head is perfect -- provided you aren’t afraid of heights. It also gives you a one-of-a-kind view of the island and all of its natural beauty, which more than makes up for possibly peeing your pants. You can choose to do a two-hour zipline tour or challenge course, allowing you to see the island from a totally unique perspective, or you can get out on the water and become a legit sky pirate on a parasail adventure. There are three family-friendly mini-golf courses on the island, and they’re each pretty popular. Pirate’s Island is (as you may have guessed) pirate-themed, complete with skeletons clinging to treasure chests and smoking cannons, and features two courses which vary by level of difficulty. Adventure Golf is both a putt-putt course and arcade (the only one on the island), and both of its courses are lagoon-themed, with waterfalls, ponds, and bridges. If you’re a total mini-golf expert, Legendary Golf’s professional and a championship course (which have been recently renovated) should up the challenge level, and there’s even an “all day play” option for a slightly higher price. Being an island, Hilton Head has it covered when it comes to watersports. Whether you’re after boating, tubing, jet skis, kayak and other watercraft rentals, dolphin tours, or stand-up paddleboarding, you’re basically guaranteed to find something that’ll interest you -- provided you actually like the water. For those who are happiest on deck with a fishing pole in hand, Hilton Head’s also home to a number of fishing charters that offer inshore, offshore, deep sea, and shark fishing excursions. If you like your cocktails a little more elevated (literally), Poseidon’s Rooftop Bar offers just that. 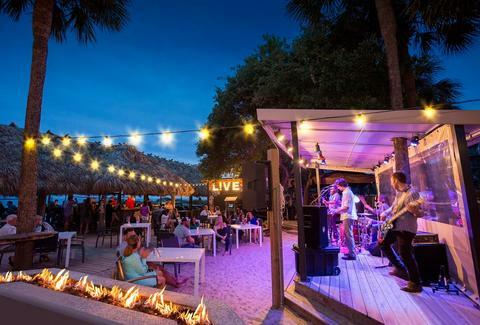 With one of the best sunset views on the island, the Rooftop also hosts a number of live events on the weekends, including live music, dance parties, and more. The cocktails are inspired by “flavors from our favorite coastal adventures,” which presumably means they pair well with salty air/horseshoe crabs/seaweed. Hilton Head Island is about 12 miles long by 4 miles wide, and features a number of biking trails between beaches and various attractions -- meaning you can ditch your car in favor of more environmentally friendly transportation. Hilton Head is known as a recreational biking destination, and they take that honor very seriously. Download the free public multi-use pathway map before you go, so that you can plan out how best to get to all the places you want to visit during your trip, sans automobile. The beach will thank you.